They’ll steal all the change from your pockets, and your hearts. It’s the rogues! About a year ago, I and 2 other guild-mates got into a discussion over the “personality” of rogues, and what they should actually “be” like. 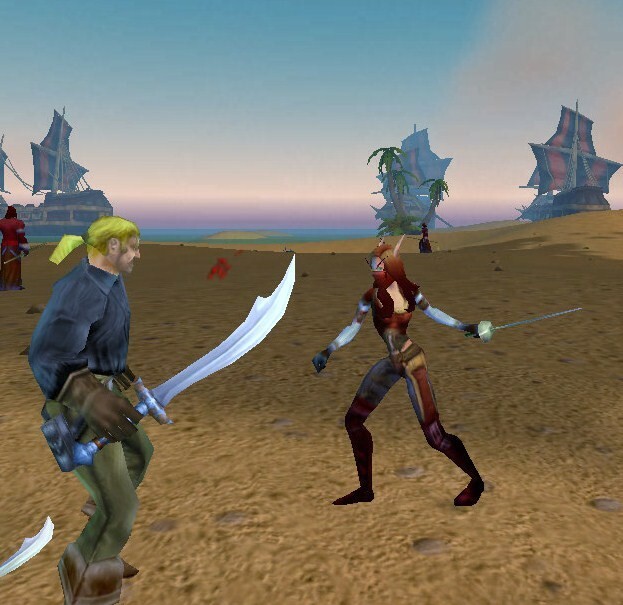 One guildie (who’s main character was a rogue) argued that they should be powerhouses – the major, “in your grill”, class that duel wields massive swords and maces that smash people’s faces in. The other guildie’s take on rogues were that they were more of the “swashbuckler” class (he compared them to one of the adventure guys from Princess Bride…lol, I guess…maybe? ); they swindled people out of money, were the first to join in a bar fight, and wielded a long rapier or dagger. As for my opinion, rogues are very sneaky, and very deadly. 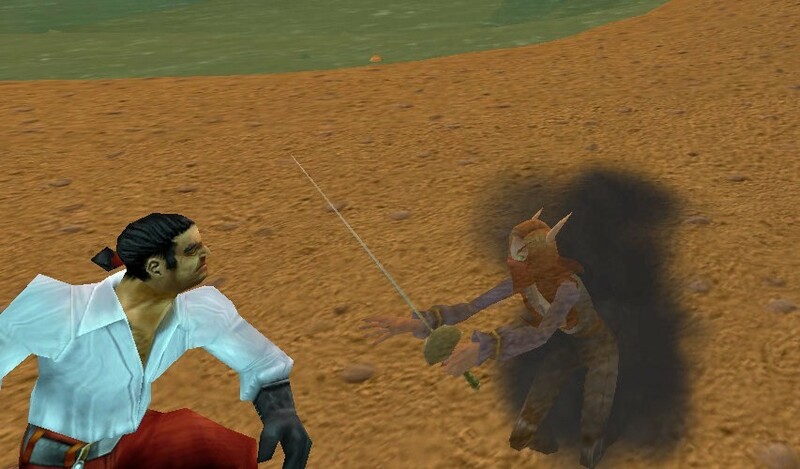 And while most would like to be a “powerhouse”, particularly during PvE fights, my argument was not to throw away one of the main characteristics of rogues: the ability to sneak up, kill, and disappear, leaving the victim, and everyone else to wonder “WTF just happened?” These rogues use very sharp, poisonous daggers, and, if time allows, they might steal your possessions ^_^. LoL, so, with this all stated, I tried to make each of the outfits below match in one, or a hybrid of, these categories. Please note that this is not an article over rogue gear. That’s something for Elitist Jerks to figure out…LoL, just didn’t want any comments on this article to be “L2P n00b…that chest is for feral druids”… ^_^ or whatever. For these types of rogue outfits, one will need to use larger leather shoulder armor and helmets. However, this raises the level requirement of the outfit, as most of this armor will be found at higher levels. 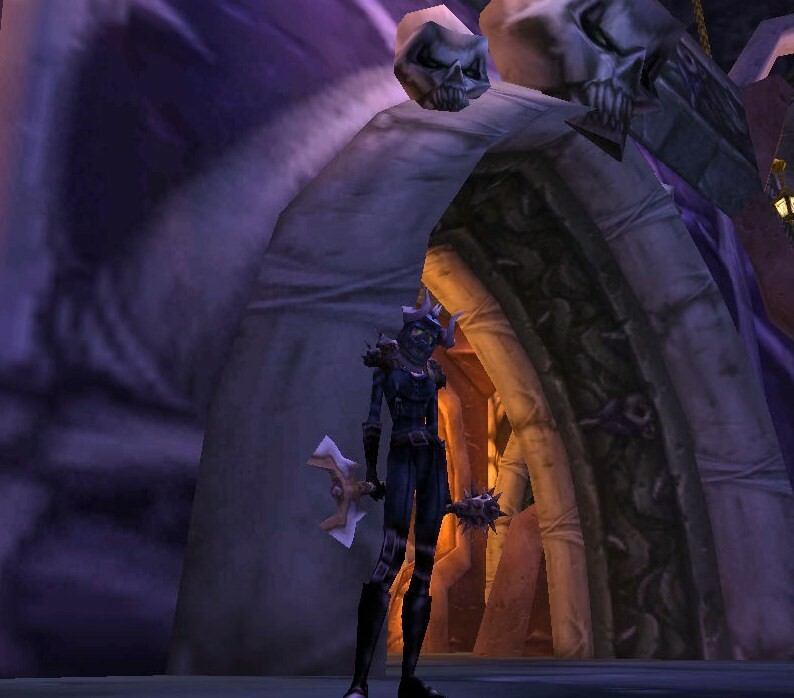 The Heroes’ Bonescythe Pauldrons are Kirina’s current PvE shoulders (I told you her gear sucked ^_^), and the Horns of Electrified Terror is a reward from a Northrend quest. 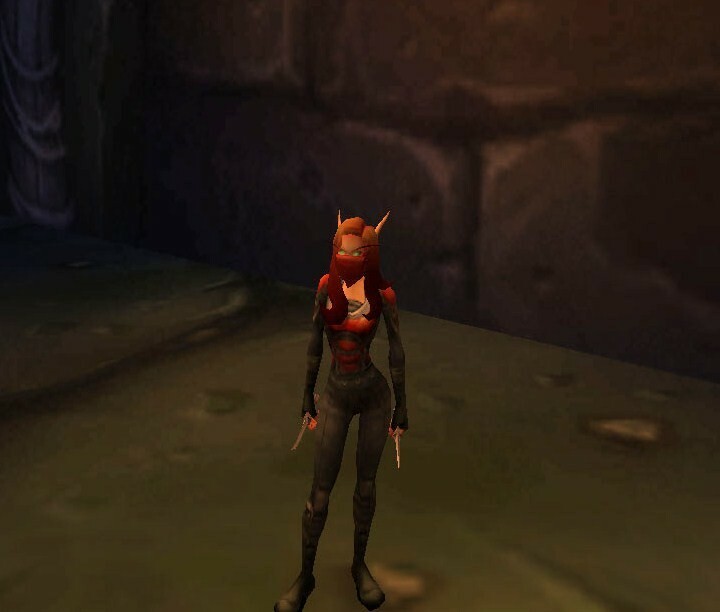 It will be tempting to use plate/mail armor to complete this look, but, to stay true for rogues, it will be better to stay in the cloth/leather armor realm. 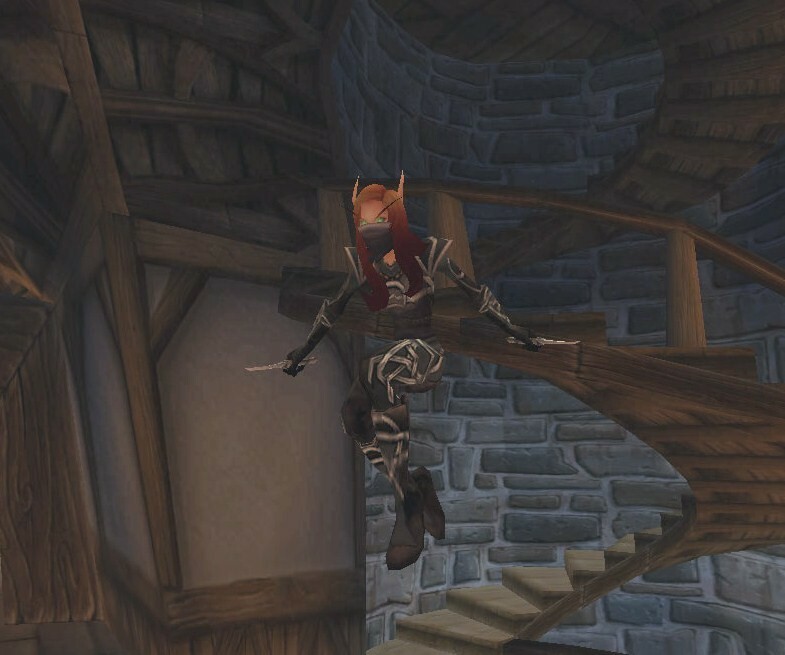 The Blackened Blade is a drop out of Northrend dungeons, but any other large, one-handed sword will work just fine (again, two-handed swords are not being “authentic” ^.^). The rest of the pieces in this outfit are from “old” Azeroth. The Defias pieces are all zone drops out of The Deadmines (the chest is a “boss” drop). It might take one a while to farm for all the pieces, and to get the chest-piece to drop (took me like 7 runs before it did). The Defias Leather set on its own also makes a nice RP rogue set as well. The Master’s Leggings is a low world drop, and not easily farmed for. 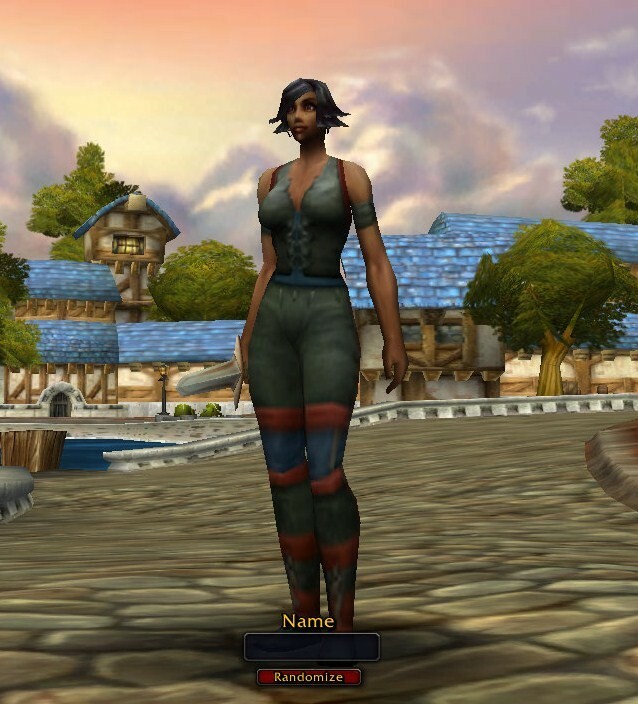 This outfit includes some Scouting leather pieces (random world-drops), that, in its whole set, also makes a great rogue RP get-up. 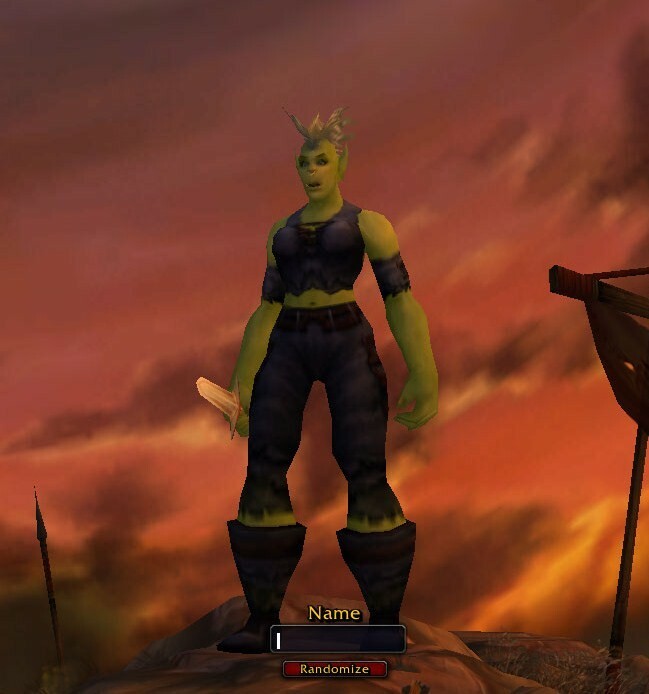 The Metalworking Gloves are a drop from the Goblin Craftsman in The Deadmines, and the buckles around the wrists match the buckles on the Bandit Boots. These boots are an uncommon world drop; however, they do have a cloth and common equivalent: the Recruit’s Boots – which are the starter boots for Human/Gnome/Dwarf Warriors. They can also be bought from Thomas Yance. This outfit show-cases some other large weapons to include with the “powerhouse rogue” outfits. Since patch 3.2, rogues can now equip one-handed axes, so, wielding (either single or duel) a large battle-axe, like the Warlord’s Axe will give dangerous appeal. The Hyldnir Headcracker was a Northrend quest reward, but, large, spiky maces like it will also have the same effect. The Demon Cured Tunic is a common drop from a rare mob found in Hellfire Peninsula. 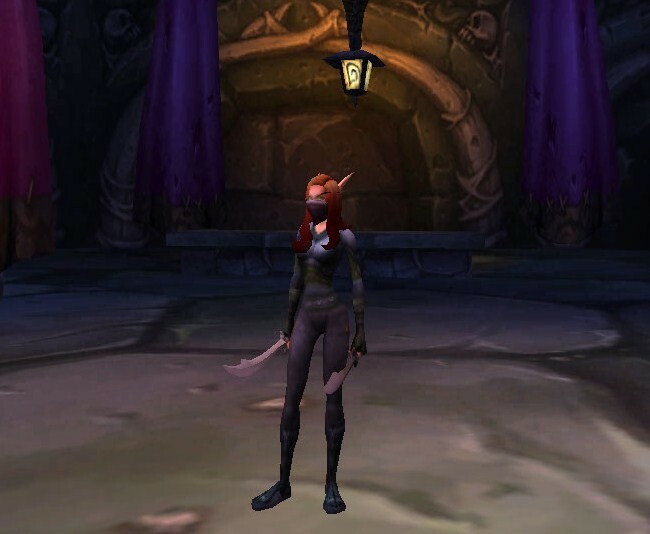 The Red Defias Mask is a drop out of The Deamines; however, only equip-able by rogues. There are some other all-red mask alternatives, such as the Bloodwoven Mask, Outlander’s Facewrap, and the Blooddrenched Mask. This outfit also uses maces. These two maces used were saved from Kirina’s old level 70 gear while she was maced-spec’d for a bit. They can be replaced for other large maces, like the Hyldnir Headcracker from the previous outfit. Next up are the “swashbuckler” type rogue outfits. I kept these outfits easy, but, a good example on what these two next outfits are leaning toward is found on a rogue trainer in Booty Bay, Ian Strom. 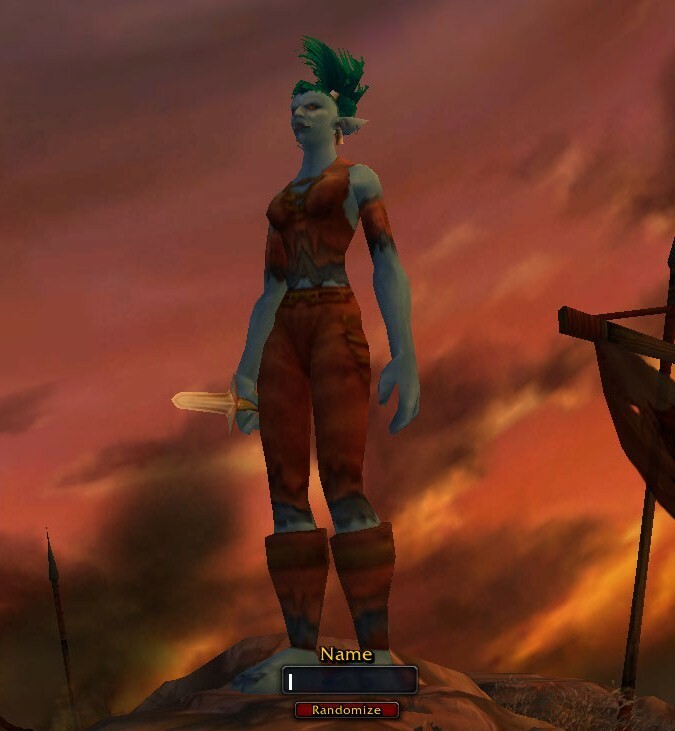 The Whispering Vest is sold in limited quantities by a few vendors; I bought Kirina’s from a Goblin out in The Barrens. It’s great casual wear too! ^_^ The Adamantite Rapier is crafted by Blacksmiths, and, is probably the easiest of its kind to get. However, some alternatives for this rapier include: Dazzling Mithril Rapier (also crafted, yet, requires more materials to make), Defias Rapier, and the Tainted Pierce. Even though Kirina only has a couple of pieces, the Swashbuckler Set is another great outfit set to have either some of, or all of, the pieces of armor. Very rugged, and very stylish; however, they are all world-drops, so, you’re best bet would be the local auction house, or your incredibly good luck ^_^. 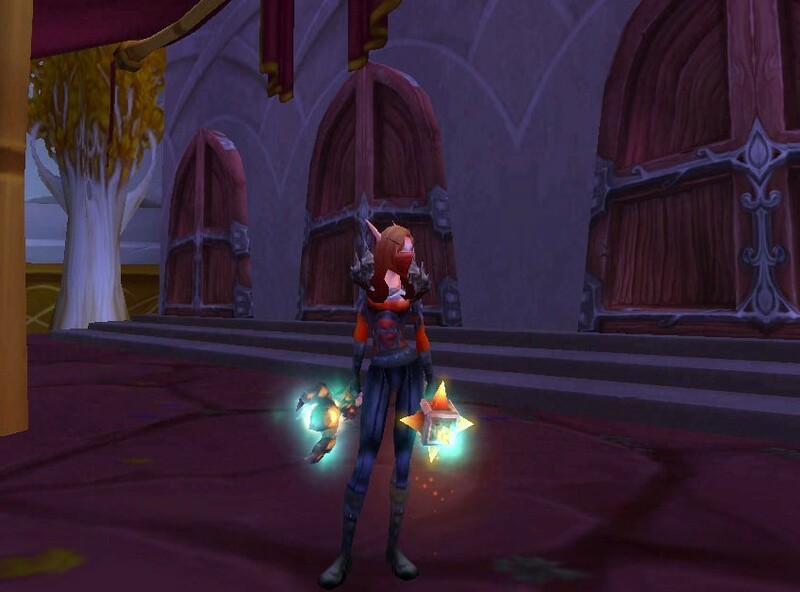 Instead of the Apothecary Gloves (Horde quest reward), one could opt to equip the Bard’s Gloves to match the boots. 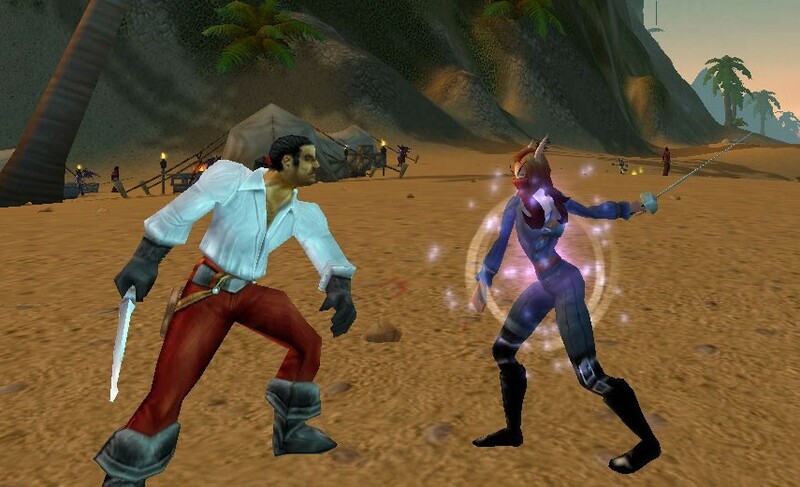 My reason on why I didn’t use these was because I wanted the puffy white sleeves of the White Swashbuckler’s Shirt to be more apart of the outfit (not wearing any gloves would get a better result, but, whatever). And now, finally, the “ninja” rogues…and the outfits that I feel look most like the “spirit” of rogues. 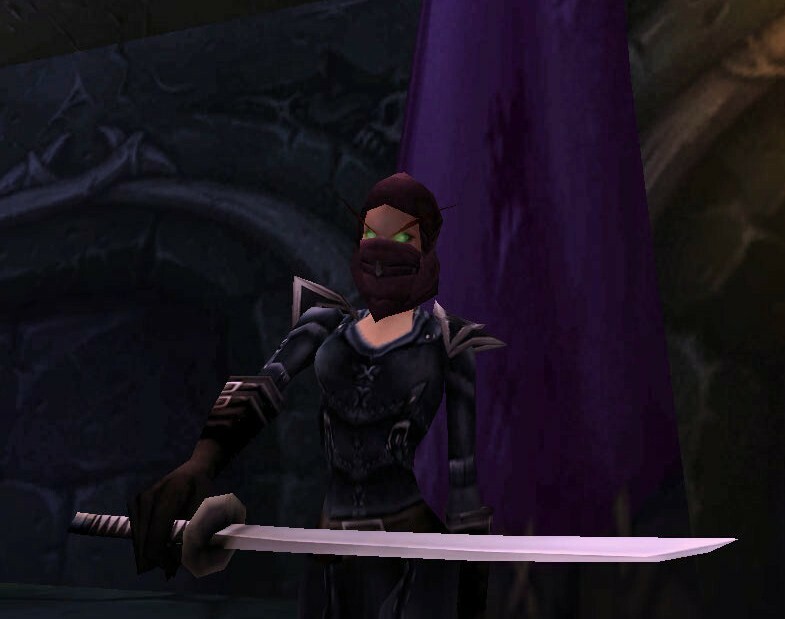 The Silver-thread set are all world-drop pieces, but is, in my opinion, the perfect RP rogue outfit, especially for classes who can only wear cloth. As seen in this outfit, if you can’t find the Silver-thread Gloves, the Master’s Gloves are an unnoticeable alternative, has they have the same silver design to match the outfit. Also, any daggers will do for this outfit. I stayed simple (and cheap) by using the Small Daggers that dropped for me while farming The Deadmines. 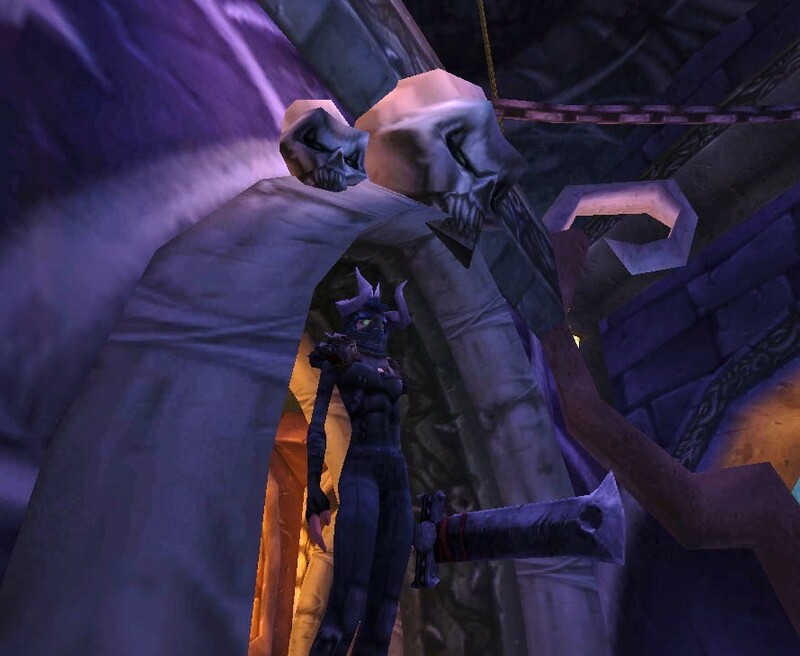 The Ebon Mask was actually a reward from a rogue-only quest. However, there are some other all-black facemasks to consider for substitutes: Sunroc Mask and the Clefthoof Hide Mask. This is the more stealthier Demon Cured Tunic outfit using the Small Daggers, and a more unified color blend for added camouflage. Again, this is the more “stealthier” version of the axe/mace one before it. I used the Silver-thread Amice again for this outfit because a) Only pair of small-ish, black shoulders I had available, and b) They still look great ^_^. Another shoulder piece to consider, that would bring more uniformity throughout this outfit and others would be the Scouting Spaulders, or even the Bandit Shoulders. The Hanzo Sword gives this outfit instant ninja appeal with its “samuri-like” style. It’s a low world drop, but, there are some alternatives that will work just as great, should you be able to find these as well: Assassination Blade, Doomforged Straightedge, Joonho’s Mercy, Reforged Blade of Heroes, or the Skystrider Katana. Hoods like the Dementia Hood are also nice to have on hand for those unexpected ninja moments. This helm style is found in several other head-wraps, and in all colors. Some of all-black masks like this include: Darkguard Face Mask, Mask of Veiled Death Shadowcraft Cap, or the Scout’s Hood (quest reward). Using the crafted Nightscape Tunic that matches well with the Knitted Pants, this outfit still is dark, but not necessarily black – just for some added mix ^_^. The two scimitars I’ve had for a while, as I actually looted them at some point. They can be replaced with any other lighter sword. 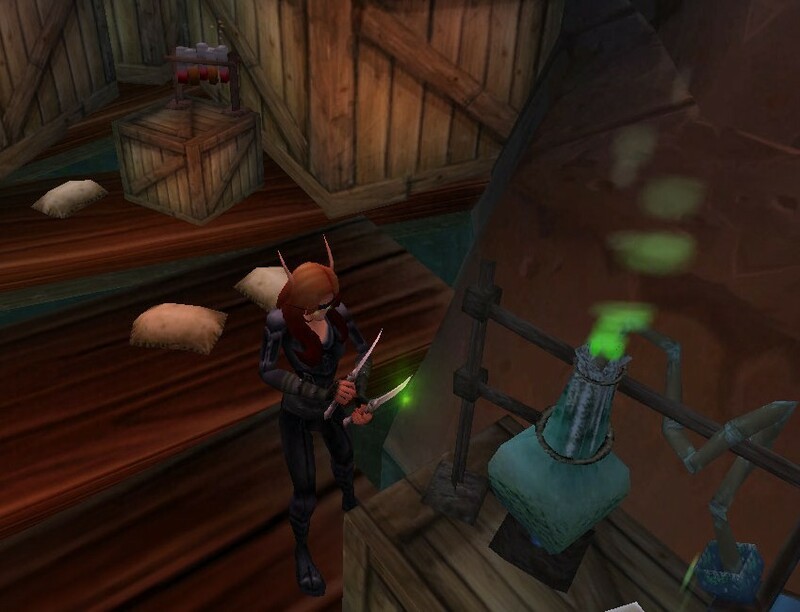 Rogues like to put nasty and deadly poisons all over their blades. Once applied, the poisons will “drip” off the equipped weapons for the duration of their application. Get the same look by using a cheap weapon enchant that will give a green-ish glow, such as Agility or Potency to name a few. LoL, sorry for these last 3 cheesy pictures. Just wanted to show different races in the easiest way possible ^_^. 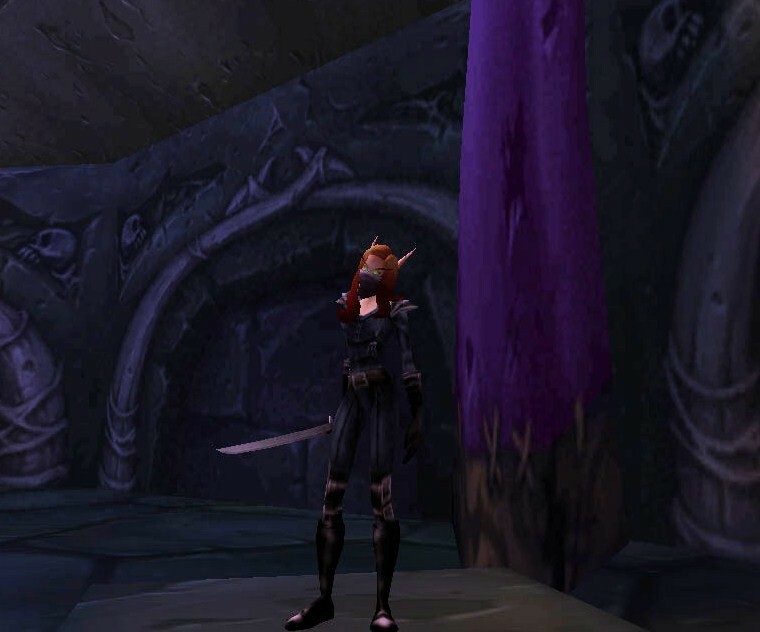 I hope this article has given you some ideas for what a rogue RP outfit can be. If you have any outfits of this style you would like to share with the world, check out the Guest Writing board on the Kirina’s Closet Forum to make a post about this article – it’ll be made into a post on this site!